Enjoy a fabulous day shopping! 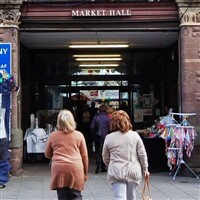 Trips to Abergavenny Market, Bath, Chester, London, Cardiff, Shepton Antiques Fair just to name a few. Open-air and indoor markets, each with their own distinctive flavour, line a street of shops, bars and restaurants - it can only be Camden Market! Always a popular day out, to one of the best markets in Wales, all in a wonderful setting.